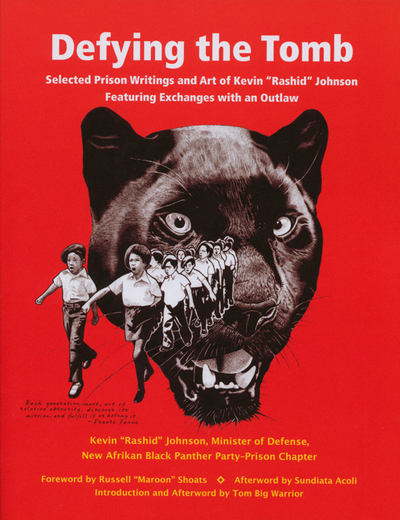 Defying the Tomb is the name of a brand new book by Kevin Rashid Johnson, of Richmond, VA, who has been held in solitary confinement at the Red Onion Virginia State Prison for years. Very Soledad Brother-esque, this book is a collection of letters between Johnson and a fellow prisoner, Outlaw. It also includes some essays written by Johnson discussing a variety of political issues. Acclaimed by several political prisoners and movement veterans, its a must read. The art exhibit accompanying the book is amazing. All of the original works produced by Johnson will be available for viewing. The art was produced within the confines of a small solitary confinement cell at the Red Onion in southwest Virginia where Johnson has been held 23 hours a day for years. Drawn with only paper and a ball point pen, it reflects inspiration by many leading revolutionaries and thinkers, such as George Jackson and Che Guevara. Featured speakers for the event are Mack Gaskins and Kate Piper. Mack is the Minister of Information for the New Afrikan Black Panther Party – Prison Chapter and was in neighboring cell while he was at the Red Onion maximum security prison with Rashid. Kate Piper, a prison activist, befriended Rashid and transcribed the letters and writings that make up the book was instrumental in getting it published. Moderating the event will be Naji Mujahid of the Black August Planning Organization and WPFWs “Voices With Vision”. Follow the author’s odyssey from lumpen drug dealer to prisoner, to revolutionary New Afrikan, a teacher and mentor, one of a new generation rising of prison intellectuals. This book consists primarily of letters between Rashid and Outlaw, another revolutionary New Afrikan prisoner, smuggled between the segregation wing and general population over a period of months. These comrades educate themselves – and us as well – on Marxism and Maoism, the Five-Percenters, Dialectical Materialism, Dead Prez, Capitalism, Racism, Imperialism, Class Struggle, Revolutionary Nationalism, New Afrikan Independence, Psychology, and a host of other subjects, as they grapple with how to promote revolutionary consciousness in the most hostile of environments. Rashid has been in prison for twenty years – the past eighteen of which in segregation (solitary confinement). Shortly after this correspondence between himself and Outlaw, he and his comrade Shaka Sankofa Zulu founded the New Afrikan Black Panther Party Prison Chapter. The NABPP-PC has since developed branches in various prisons across the U.S. empire and has its own newsletter, Right On! A number of Rashid’s essays written as Minister of Defense of the NABPP-PC are also included in this book. On May 2, 1973, Black Panther Assata Shakur (aka Joanne Chesimard) lay in a hospital, close to death, handcuffed to her bed, while local, state, and federal police attempted to question her about the shootout on the New Jersey Turnpike that had claimed the life of a white state trooper and Zayd Shakur, a Black revolutionary. Long a target of J. Edgar Hoover’s campaign to defame, infiltrate, and criminalize Black nationalist organizations and their leaders, Shakur had already been dogged by police accusations of criminal activities, although the cases against her were always dismissed due to the complete lack of evidence. More than simply a political chronology, in this book Assata Shakur shares the life experiences that led her to embrace revolutionary politics and the fight for human liberation. She discusses her childhood, life in the Black Panther Party, and what it was like at the time to be faced by government repression, sanctioned by the FBI’s lethal Counter-Intelligence Programme. Assata had faced the standard repressive fare of trumped up charges and bogus arrests since shortly after she joined the Black Panther Party. The harassment and vilification continued, forcing her into the underground. On May 2, 1973 she and her comrades Sundiata Acoli and Zayd Shakur were driving on the New Jersey Turnpike when a state trooper pulled them over in a case of Driving While Black. Shots were exchanged and Zayd and one of the white state troopers were killed. Shot and seriously injured in the incident, Assata Shakur was at the time on the FBI’s most wanted list, and orders had been given for her capture dead or alive, because she was supposed to be armed, dangerous, a kidnapper and murderer. Although Zayd Shakur was the only one on whom a weapon was found, Assata and Sundiata were both tried and convicted of murder in 1977. Two years later Assata escaped from prison with the help of the Black Liberation Army. She has been living as a political refugee in Cuba since the mid-eighties. American law enforcement officials and right-wing politicians have put a bounty on her head, and continue to lobby for pressure to be put on the Cuban regime to extradite her. In 1960, at the age of eighteen, George Jackson was accused of stealing $70 from a gas station in Los Angeles. Though there was evidence of his innocence, his court-appointed lawyer maintained that because Jackson had a record (two previous instances of petty crime), he should plead guilty in exchange for a light sentence in the county jail. He did, and received an indeterminate sentence of one year to life. Jackson spent the next ten years in Soledad Prison, seven and a half of them in solitary confinement. Instead of succumbing to the dehumanization of prison existence, he transformed himself into the leading theoretician of the prison movement and a brilliant writer. Soledad Brother, which contains the letters that he wrote from 1964 to 1970, is his testament. In his twenty-eighth year, Jackson and two other black inmates — Fleeta Drumgo and John Cluchette — were falsely accused of murdering a white prison guard. The guard was beaten to death on January 16, 1969, a few days after another white guard shot and killed three black inmates by firing from a tower into the courtyard. The accused men were brought in chains and shackles to two secret hearings in Salinas County. A third hearing was about to take place when John Cluchette managed to smuggle a note to his mother: “Help, I’m in trouble.” With the aid of a state senator, his mother contacted a lawyer, and so commenced one of the most extensive legal defenses in U.S. history. According to their attorneys, Jackson, Drumgo, and Clutchette were charged with murder not because there was any substantial evidence of their guilt, but because they had been previously identified as black militants by the prison authorities. If convicted, they would face a mandatory death penalty under the California penal code. Within weeks, the case of the Soledad Brothers emerged as a political cause célèbre for all sorts of people demanding change at a time when every American institution was shaken by Black rebellions in more than one hundred cities and the mass movement against the Vietnam War. Soledad Brother went on to become a classic of Black literature and political philosophy, selling more than 400,000 copies before it went out of print twenty years ago. Lawrence Hill Books is pleased to reissue this book and to add to it a Foreword by the author’s nephew, Jonathan Jackson, Jr., who is a writer living in California. In 1829 David Walker, a free black born in Wilmington, North Carolina, wrote one of America’s most provocative political documents of the nineteenth century, Walker’s Appeal to the Coloured Citizens of the World. Decrying the savage and unchristian treatment blacks suffered in the United States, Walker challenged his “afflicted and slumbering brethren” to rise up and cast off their chains. Walker worked tirelessly to circulate his book via underground networks in the South, and he was so successful that Southern lawmakers responded with new laws cracking down on “incendiary” antislavery material. Walker’s Appeal represents one of the earliest African-centered discourses on an oppressed people’s right to freedom. African American political philosophy has evolved from many of the themes that it articulates. We should explore the relevance of the Appeal in the 21st Century. You are currently browsing the archives for the Book Readings category.